'Lego Mondrian' oil on linen, 10 x 14 inches, 2015, private collection. 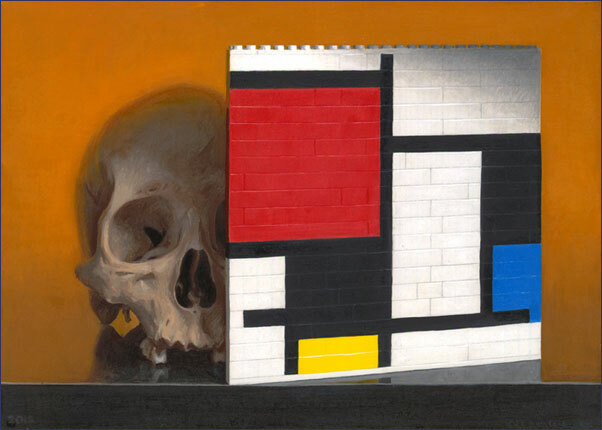 In Conor Walton’s Lego Mondrian a human skull peers from behind a wall of plastic Lego blocks. The skull, a subtle natural form, is also a traditional “vanitas” symbol that has served generations of painters as an image of mortality. The Lego blocks are children’s toys— modular bricks molded by a machine—that click together to form the severe geometries of a Mondrian painting. These two visual elements are so different that their appearance together is decidedly unexpected, even jarring. In fact, their obvious dissonance raises a question in the viewer’s mind: what on earth are they doing in the same painting? "Rectangles and grids are hardly ever found in nature because they are structurally rigid and brittle. Living nature always follows the path of growth, which is curved and flexible. A skull is a perfect example; it is generated out of continuous curves. Structurally, it is way more sophisticated than the Mondrian grid. In my book it is also way more beautiful, as things which grow are always more beautiful than things that are schematically constructed. I think the skull wins the battle in this painting because of its subtlety and depth." Of course, this confrontation between nature and culture is about more than beauty. 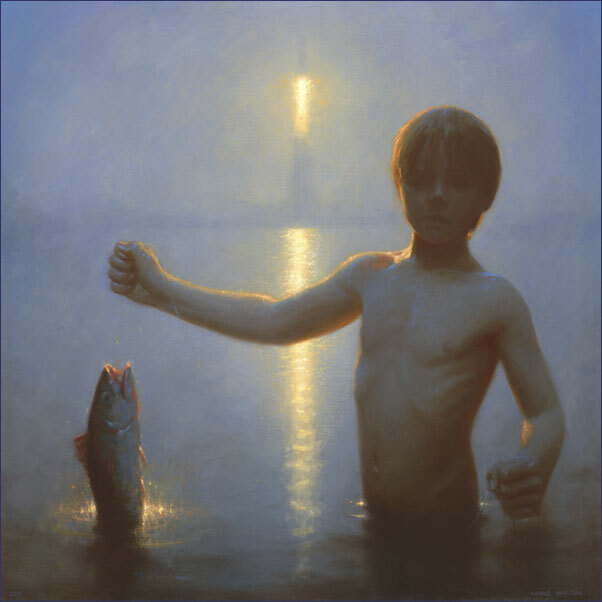 Walton acknowledges that “art and nature have always been at war” but he also perceives humankind as now being in its most precarious situation ever, moving with alarming rapidity towards environmental catastrophe and possible extinction: those are the deeper concerns animating his paintings. Culture is a “façade” and an artificial construction that blocks our view of nature and mortality. The belief in progress, a key element in modern culture, also shields us from the consideration of grander forces that may shape our destiny. "Despite the fact that I live in a very peaceful part of the world, well insulated from most of its troubles, at this point I fear for my children’s future and the future of everything that I hold dear." Because of his skeptical view of progress, Walton’s ideas about art are distinctly retrospective. The currently accepted model of art history in which tradition is discarded during an insistent and unified march “forward” strikes Walton as ludicrous and perilously naïve. Ever since he read Sir Kenneth Clark’s Civilization at the age of 17, Walton has been struck by what he sees as the “discontinuity with classical or humanist concerns that modernism embodied.” For Walton, to be a serious artist has meant adopting the models and methods of earlier European masters whose concerns for nature and humanity were broader and more deeply sourced. His work—like theirs—still has its basis in observation, and nature remains his ultimate touchstone and reference point. In his painting The Enemies of Progress Walton includes a small figure of himself—brush and palette in hand—leading a crew of misfits that includes dinosaurs, extinct and endangered species, indigenous peoples, old gods and heroes. The assembled figures stand for all those whose beliefs, values, and ways of life are threatened with obsolescence; those whose very existence is undermined by the “March of Progress.” They are preparing to attack a gleaming but generic cluster of architectural forms, a bland, featureless utopia that resembles a modern city skyline. The Enemies of Progress is a principled, courageous, and darkly comical painting. As in all of Walton’s work, the strain of humor is extremely pointed: it is serious humor infused with tragedy. helplessly. Superman looks away—he at least has the resolve to avert his attention—while the Joker closes the deal. Set in a stage-like space that puts the family on display in a kind of natural history diorama, Walton’s Arcadia generates a personal and nervous familial image of perpetual innocence, shaded by mortality. 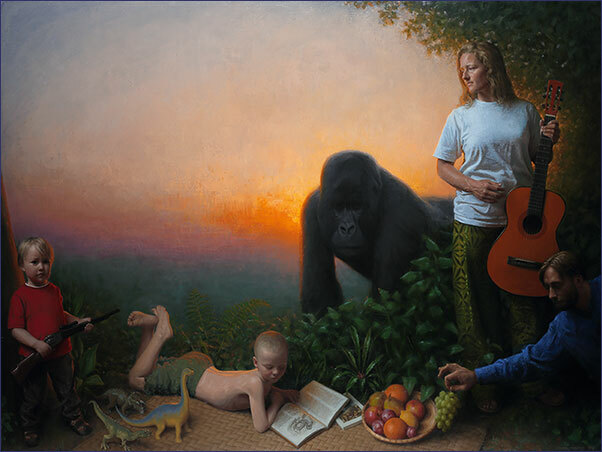 The gorilla that appears in Et in Arcadia Nos adds the element of an endangered but related species and adds an elegiac tone to the composition. 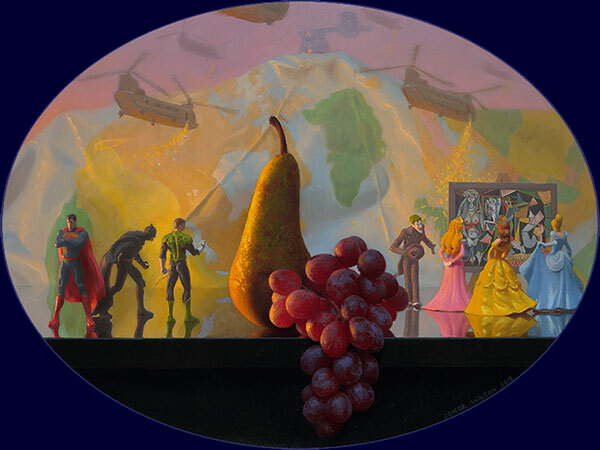 It’s a painting that constructs a walled-off “Golden Age” to symbolize the fate of humanity. One might argue that, in terms of affluence and life-expectancy, humans have never had it so good: if any time can be called a Golden Age surely it is ours. But our affluence has also bred a childlike optimism, a disconnection from the harsher facts of life and the harder lessons of history. Ignoring these, we sow the seeds of our own destruction. Interestingly, Walton says that despite—or perhaps even because of—the uncompromising messages in his work, people seem more interested in it than ever. Because of his ability to generate dramas of ideas, and to paint them masterfully, Walton’s paintings are hard to look away from. Opposing easy optimism, they offer a vision grounded in realism and cathartic tragedy. It is tragedy, Walton believes, that can heal us by easing the burden of our guilt. This essay by John Seed was originally published in the catalogue to Conor Walton's exhibition 'The Enemies of Progress' at CK Contemporary, San Francisco USA, in 2015.